The Tuscan V8 sports Car. In 1962, Jack Griffith, a US Ford dealer and TVR owner, made an attempt to shoehorn a Ford V8 engine into his TVR Grantura Mark 3. Although the experiment failed, he approached TVR who agreed to offer their support. 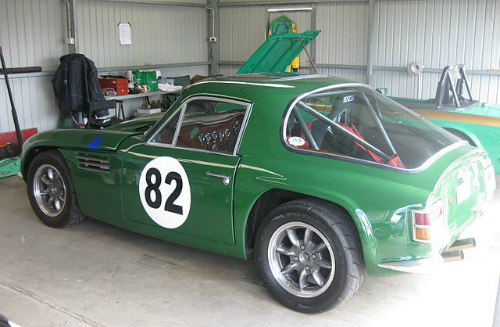 Hence, the TVR Griffith 200 sports car was born, and was showcased at the Boston Motor Show in 1964. 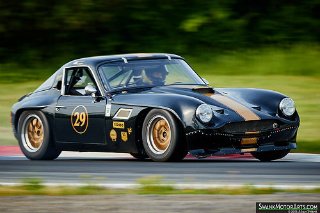 The Grantura bodies and modified chassis were shipped from TVR in the UK to Jack Griffith workshop near New York in kit form, from where he installed the engine and gearbox, and assembled the completed car. Following problems with engine overheating and other factors, the much improved Griffith 400 was premiered at the New York Motor Show in 1965. However, within a few months, production of the Griffith and Grantura ended, following a prolonged dock strike on the US east coast, when both TVR and Jack Griffith went into receivership. However, Martin Lilley, a TVR dealer, acquired the remains of TVR, renamed the company TVR Engineering, and restarted production, from April 1966, when the last 10 "400's" were built. Martin Lilley could see the merits of the "400" and, in early 1967, it was reborn as the Tuscan V8 sports car which was, in effect, a reincarnation of the "400", both physically and mechanically. It was distributed in the US with either the 195 bhp standard Ford 289 cubic inch V8 engine, or the special equipment HI PO version, as used in the early Ford Mustang. This developed 271 bhp and, fitted with a Ford 4-barrel carburetor, gave the Tuscan a top speed of 155 mph, with a 0-60 mph time of 5.7 secs. It was fitted with disc brakes at the front and drums at the rear. However, the Tuscan couldn't shake off the reputation of the "400" that dogged it, especially in respect of poor build quality. As a result, only 28 units were built, of which all but four were sold in the US. 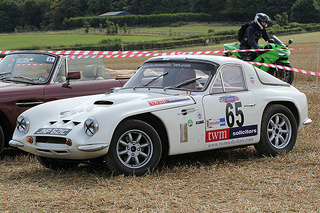 The design of the Tuscan V8 was based on the TVR Vixen. In 1967, the wheelbase of the Tuscan V8 was increased to 90 inches, and the floorpan was lengthened to increase internal space, as in the Vixen Series 2. Fitted with different rear lights, as used in the Ford Cortina Mark 2 saloon, plus an updated hood, this new long wheelbase variant made its appearance. Unfortunately, it was not well received and, by 1968, only 24 units had been built, of which around half were exported to the US. Following modifications to the chassis, the Grantura body then underwent extensive restyling, which included a longer and wider body, more graceful lines, and new bumpers fitted at both front and back. This wide body variant was designated the Tuscan V8 SE, and was launched at the 1968 New York Motor Show. Between April 1968 and August 1970, only 21 units of this variant were built, of which two of them were fitted with right hand drive. 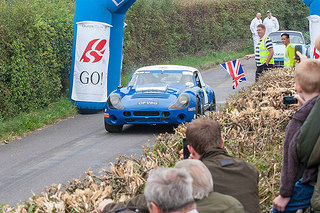 For Martin Lilley, such poor demand marked the end of the Tuscan V8. Unlike many of its rivals, the majority of TVR sales were to the UK market. In this respect, the large V8 engine used in the Tuscan V8 may have been regarded as overkill in this market, which is one reason why the smaller, more economical V6 variant, was introduced. The V8 variants continued in production until early 1971, with declining demand being partly attributed to the fact that the engine was regarded as too "thirsty". It has been estimated that a total of only 73 units of the three different variants of the Tuscan V8 sports car were built.